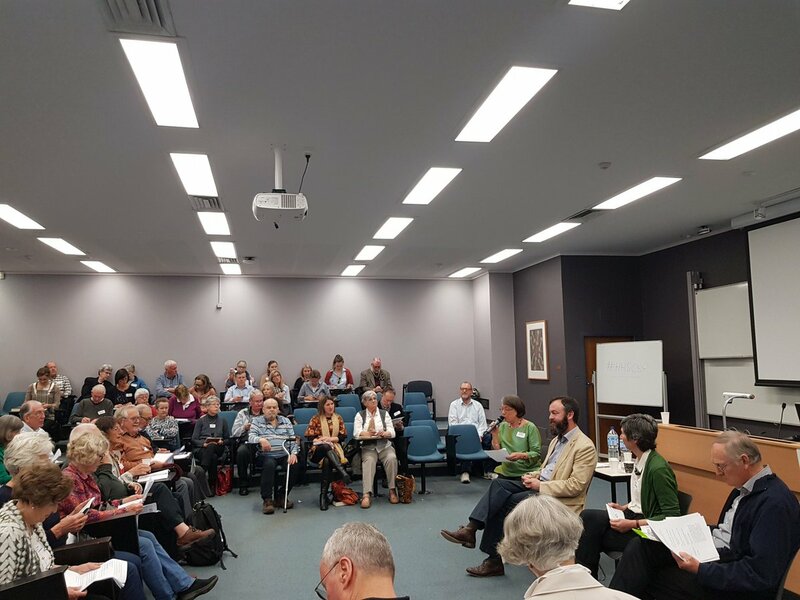 Update 20 November 2018: Francesca Beddie of Professional Historians Australia NSW writes about the symposium. More than one hundred souls turned out for the Honest History symposium in Canberra on 8 November. The tone was set by a heartfelt and inspiring Welcome to Country from Aunty Matilda House, Ngambri-Ngunnawal Elder, which reminded those present that they met on stolen land. Aunty Matilda also pointed to the relative lack of young people and people of colour in the audience. Four lively sessions followed, with the recurring themes being the complexity of history, the prevalence of gendered views of Australian history, the difference between patriotism and jingoism (including the role of Anzackery), the future of the profession, and the opportunities to change the direction of our history towards, for example, the Republic and independence in foreign policy. Tweets at #HH5CBR picked up the flavour of the day and there was general approval of the Q&A style of the sessions. There were no formal papers, almost no Powerpoints, and up to 30 minutes a session for free-flowing discourse. There was animated discussion at morning and afternoon teas and over lunch (catered by Hudsons). At the morning break, we heard Michael Brissenden of the ABC launch Paul Daley’s book On Patriotism (complete with dedication to Honest History). This followed an opening session with Honest History president and Head of the ANU School of History, Frank Bongiorno, quizzing Paul Daley and Clare Wright, author of You Daughters of Freedom, on how history is presented. Paperchain bookstore of Manuka did a brisk trade over morning tea and lunch, with these and other titles selling well. When we began the Honest History venture we envisaged that it would last for five years, roughly the time span of the Anzac centenary. Now that the five years is well and truly up, we are looking at ways of keeping the website active in a way that minimises demands on our (small and exhausted) group of volunteers but that continues to provide a useful resource for students, teachers and the general public. Exactly what this future comprises – and how long it lasts – is still being worked out. In 2019, you will still find us at honesthistory.net.au, admin@honesthistory.net.au, on Twitter and Facebook, and through our occasional newsletters. Please keep in touch. Ultimately, the future of voluntary ventures depends upon striking a balance between expectations and capacity. Meanwhile, much thanks to all of those who helped (particularly discussion leaders Frank Bongiorno, Pamela Burton, and Carolyn Holbrook, and Sophie Napier of the School of History) and participated in our symposium. In a way, the World War I centenary was a needed reminder of the impact of our involvement in the Empire war, the cross-over into industrial war, the impact on Australia, particularly country towns and families. The death toll of 61,000 exceeds all our war deaths in the century since. Monday, I lunched with my oldest friend, President of the RSL in Victoria, from a regional family damaged by the war. He knew I fought his war (Vietnam) with a sign on the streets. He knows now that we were not against them, and are still wanting to see vets helped through what their nation put them through, and continues to inflict upon them. The need for the stories to be told still remains. But it doesn’t excuse the political appropriation, especially the false Australian foundation myths. And it must be the whole story – the conscription plebiscites, the deaths of five times as many Turks defending their own country, the internments of ‘aliens’, the battles of families at home coping without bread-winners, the return of broken men, and the families broken by death and trauma. As well, it must include the stories of before and after the Empire war, from invasion through to the Whitlam-era progressions, to the present, in which we still support ‘empire’. The impact on still-colonial thinking Australia was still there in my youth (born 1948) and really only started to fade from the 1960s – two generations later. Australia really started to ‘come of age’ as it grew away from ‘Mother England’ and forged its own identity, based not on Empire wars, or any wars, but on all its people. I’m glad to have been associated in my small way with the HH mob and have gained much – mainly reassurance that I was not alone – from your publications. HH strived to get out a message I had heard before from ex-Kokoda vets to current serving soldiers: what about ‘our’ place in our nation’s history? Clare Wright and others remind us of some of the other 80 percent who were not soldiers. And I’m also relieved to be past ‘peak Anzackery’. Now perhaps we can get on with the task of coming to grips with our real foundation stories – colonisation, conquest and dispossession and all that flowed from it – and understanding that our path must continue towards full recognition of our past, and to a future of true independence. What now for HH? Don’t let it die!!! Somebody has to continue to fight these battles, and help our nation come to grips with its past and its future. Thanks to HH for keeping truths emerging through the cloud of Anzackery and political appropriation of our past. I look forward to future books, articles and even more gatherings, not to mourn the passing of HH, but to forge on in the unending battle for honest telling of our history.